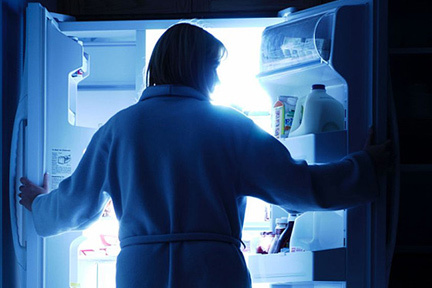 Going to sleep at the same time every night will stop your food cravings in their tracks. Brigham Young University found that people who went to bed and woke up at the same time each day were significantly slimmer than people with inconsistent sleep schedules. That’s because an erratic sleep schedule prompts changes in the brain that not only cause it to pump out more hunger hormones– those brain changes trigger cravings whenever you see images of food. So go to bed at the same time every night to get rid of your out-of-control food cravings.